The Pelican Links Cases involved a dispute over pre-emptive clearing of a melaleuca wetland near Caloundra in South-East Queensland and a subsequent criminal prosecution and planning appeal for the development. a criminal prosecution to fine the developer for the pre-emptive clearing. The clearing was pre-emptive in that it was intended to "assist" the developer's application for the large masterplanned community by removing vegetation that council wanted to protect and that would, therefore, be an obstacle for the approval if it remained. Mr Dineen then ordered a helicopter charter and he and other Council officers overflew the site at about 2:15pm. He took photographs of what he saw. 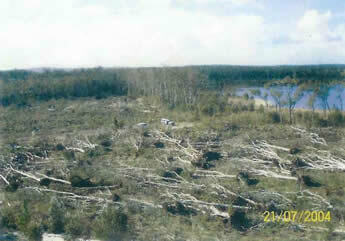 He saw (2) bulldozers working clearing trees, and several work-men on the ground and (3) other vehicles. He saw trees marked with pink tape and a large tract of trees on the ground. He returned to the Golf Club at 7:30pm and observed that Naskan Security officers were still on duty. Some of the photographs taken by council officers from the helicopter are shown on the right of this page. 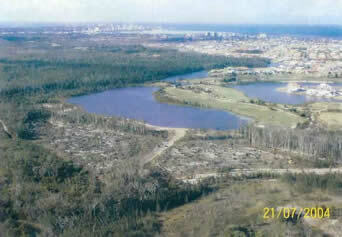 The photographs show the trees cleared and bulldozers on site in the foreground. The Planning & Environment Court halted the clearing with an interim injunction and later declared that the clearing was unlawful because it contravened a condition of a 1996 approval for the land. The developers then appealed against this decision to the Queensland Court of Appeal. The appeal was dismissed. After the Planning & Environment Court halt the pre-emptive clearing the developers applied for planning approval from the council. Council refused the application. The developers then appealed the council's refusal of their development application to the Planning and Environment Court. The court dismissed their appeal and upheld council's decision to refuse the development application. While the pre-emptive clearing was stopped by the Planning and Environment Court, there was no power in those proceedings to impose a fine for the development offence that had been committed. In order to obtain a significant fine against the developers to deter others from similar conduct, council commenced criminal proceedings in the Magistrates Court. The magistrate stayed (i.e. stopped) the case proceeding due to technical concerns about the prosecution case. Council subsequently appealed against the Magistrates Court's decision to the District Court of Queensland. The appeal was allowed and the matter re-mitted to the Magistrates Court for further hearing. After winning the appeal to the District Court the council did not proceed with a re-trial of the criminal proceedings. The criminal proceedings were, therefore, never brought to a resolution. These cases provide an important lesson in the quick reaction and outstanding initiative taken by officers of Caloundra City Council in acting to prevent a calculated breach of planning laws for commercial gain. In areas under high-development pressure, such as the Sunshine Coast, it is important that councils are willing to take such strong action to deter development offences. Developers otherwise have an incentive to contravene the law to obtain substantial commercial profits. Location map and GoogleEarth image of the site the subject of the litigation. Trial decision of the Planning & Environment Court granting a declaration that the clearing was unlawful and refusing to remove an interlocutory injunction restraining the pre-emptive clearing proceeding in 2004: Caloundra City Council v Pelican Links Pty Ltd & Anor  QPEC 52;  QPELR 128 (Robertson DCJ). 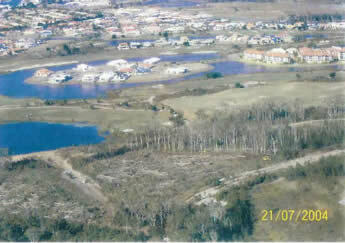 Order by the Planning & Environment Court restraining clearing of native vegetation on the land. Decision dismissing the developer's appeal by the Queensland Court of Appeal: Caloundra City Council v Pelican Links Pty Ltd & Anor  QCA 84;  QPELR 596 (McMurdo P, Keane JA, and Douglas J). Order of the Court of Appeal dismissing the application for leave to appeal. Masterplan section of development application showing structure plan, precincts, etc (Nb. 15MB). Trial decision of the Planning & Environment Court in 2006 dismissing an appeal by the developer against refusal by the council to approve a development application for a residential subdivision: Titanium Enterprises Pty Ltd v Caloundra City Council & Anor  QPEC 106 (Wilson SC DCJ). The appeal involved both the 1996 planning scheme and the Caloundra City Planning Scheme 2004. An online version of the 2004 scheme is available here. Decision of the District Court in 2008 allowing an appeal by the council against a Magistrates Court decision staying criminal proceedings for the pre-emptive clearing: Lucy v OCC Holdings P/L & Ors  QDC 4 (Robin QC DCJ). Decision of the District Court granting costs to the council for the appeal: Lucy v OCC Holdings P/L & Ors (No 2)  QDC 169 (Robin QC DCJ). 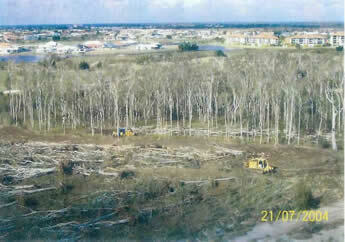 Page photos: Photographs of the pre-emptive clearing occuring on 21 July 2004 taken by officers of the Caloundra City Council from a helicopter flying over the site showing the bulldozers on site. Photos courtesy of Caloundra City Council (now amalgamated into the Sunshine Coast Regional Council). * Thanks to the Sunshine Coast Regional Council for supplying copies of the masterplan for the proposed deveopment.